SystemGruppen is a close partner for our customers and helps them with IT operations and IT support. In practice, we are an external IT department for our customers. We know that IT is crucial and that the daily operations of a company cannot function without a stable and secure operation of the IT solutions that support the company's operations. The pace of IT technology development is very high, and the use of IT spreads to more and more areas. It is a resource-demanding challenge to handle the operation and maintenance of a company's IT system. At the same time, the operation and maintenance of IT systems increasingly requires expert knowledge. We contribute with this expert knowledge, as SystemGruppen's consultants have several years of experience in operating IT systems - both customers' own systems and hosted solutions in SystemGruppen's data center, or solutions in public cloud, for example Microsoft Office 365 and Microsoft Azure. We provide personal service and are available 24/7. 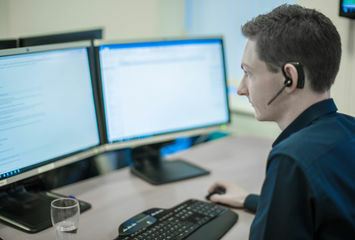 Our IT support is our customers' “go to place” when they have problems with printing documents, access to emails, questions for the Office package or other challenges related to the daily use of IT.